The MRI sequences used were axial T2, axial STIR, axial T1, coronal T1, fat saturation and coronal and axial T1 fat saturation with gadolinium contrast. 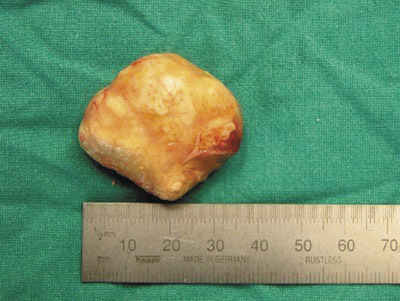 There was found to be a 3.5 cm × 2 cm subcutaneous mass in the right cheek. It had a well-defined margin and although it appeared to abut the parotid gland and the masseter muscle there was no obvious involvement of either structure. On T1-weighted imaging there was uniform intermediate signal intensity (Figure 1A). On T2-weighted imaging and STIR there was patchy/inhomogeneous intermediate signal (Figure 1B). Following contrast medium, patchy internal enhancement was demonstrated with intense peripheral enhancement (Figure 1C). None of the characteristic features of hemangioma were present. These include evidence of fat, flow voids or blood products on theMR image. Demonstration of calcification, which is normally a feature of pilomatricoma (hence its other name of calcifying epithelioma of Malherbe), is variable on MRI. No calcification was demonstrated in this case. The possibility that it was a sarcoma could not be excluded by MRI. The diagnosis of hemangioma was ruled out by MRI and therefore an open incisional biopsy of the lesion could be safely performed for diagnosis (under a further general anesthetic). On pathological assessment, the tissue was found to consist of fragments of a benign pilomatricoma showing the typical elements of basaloid foci, giant-cell reaction, ghost cells and calcification. 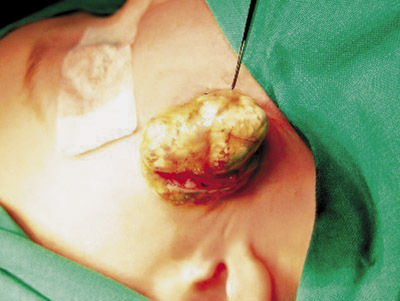 A definitive excision of the lesion was performed and at that time the patient was 12 months old. The skin over the lesion had an obvious blue blush (Figure 2A). The excision specimen was a smooth-surfaced 34 mm diameter yellowish nodule (Figures 2B and 2C). Microscopically, it was a typical pilomatricoma consisting of bands of basaloid cells maturing into ghost keratinocytes. Microcalcification occurred both in ghost cells and in strands of stromal ossification. The lesion presents as a solitary, hard, subcutaneous slowly growing mass. The average size at presentation is 1 cm in diameter.3 Usually the diagnosis is clinical and treatment is excision. Imaging studies are not usually required except when the diagnosis is uncertain or for planning operative management4 and therefore the radiology literature on the subject is sparse. 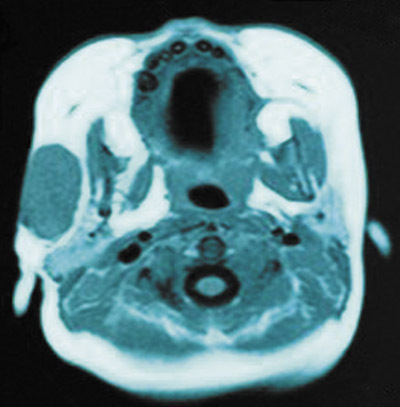 Computed tomography has also been used to investigate pilomatricomas. They appear as well-delineated subcutaneous tumors containing microcalcifications. However, the differential diagnosis for lesions with this appearance is wide and includes: sebaceous cysts, ossifying hematomas, giant-cell tumors, chondromas, dermoid cysts, foreign body reactions, degenerating fibroxanthomas, metastatic bone formations and osteoma cutis.6 There is also a significant radiation burden to take into consideration, especially in children. On T1 with contrast, some enhance,8,10 some do not7 and some only enhance peripherally.8 In this case there was patchy internal enhancement with intense peripheral enhancement. One report demonstrated mottled hypointense areas corresponding to areas of calcification8 there was no evidence of calcification on MR imaging in this case. Often pilomatricomas result in bluish or pink discoloration of the overlying skin1 that may cause the clinician to suspect a diagnosis of hemangioma. The management of hemangiomas and pilomatricomas differs—hemangiomas tend to involute with time and are initially managed conservatively where as pilomatricomas are surgically excised. A surgical excision on the face carries with it the risk of visible scarring. 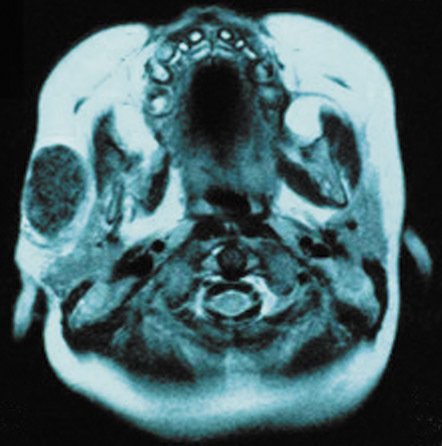 MRI can be used to identify hemangioma cases. This is a case of an unusually large pilomatricoma in an infant. It shares some features with other reports of MR imaging of pilomatricomas but the reports vary. The nonspecific features of pilomatrixoma on MRI make it difficult to diagnose. At present, the role of MRI in these types of cases is to exclude hemangioma and thus determine whether the lesion is suitable for either biopsy or excision. Danielson-Cohen A, Lin SJ, Hughes CA, et al. 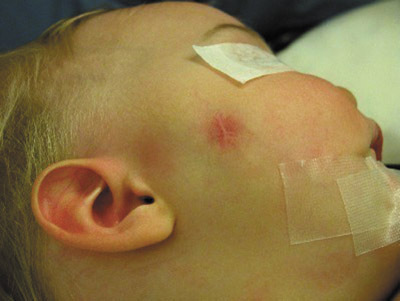 Head and neck pilomatrixoma in children. Arch Otolaryngol Head Neck Surg. 2001;127: 1481–1483. Marrogi AJ, Wick MR, Dehner LP. Pilomatrical neoplasms in children and young adults. Am J Dermatopathol. 1992;14:87–94. Lan MY, Lan MC, Ho CY, et al. Pilomatricoma of the head and neck: A retrospective review of 179 cases. Arch Otolaryngol Head Neck Surg. 2003;129:1327–1330. Pirouzmanesh A, Reinisch JF, Gonzalez-Gomez I, et al. Pilomatrixoma: A review of 346 cases. Plast Reconstr Surg. 2003;112(7): 1784–1789. Hughes J, Lam A, Rogers M. Use of ultrasonography in the diagnosis of childhood pilomatrixoma. Pediatr Dermatol. 1999;16:341–344. Som PM, Shugar JM, Silvers AR. CT of pilomatrixoma in the cheek. Am J Neuroradiol. 1998; 19:1219–1220. De Beuckeleer LH, De Schepper AM, Neetens I. Magnetic resonance imaging of pilomatricoma. Eur Radiol. 1996;6:72–75. Ichikawa T, Nakajima Y, Fujimoto H, et al. Giant calcifying epithelioma of Malherbe (pilomatrixoma): Imaging features. Skeletal Radiol. 1997; 26:602–605. 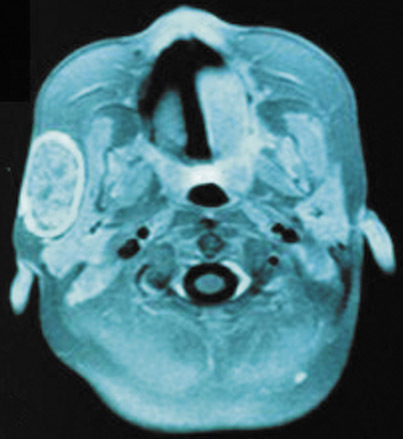 Hoffmann V, Roeren T, Möller P, Heuschen G. MR imaging of a pilomatrixoma. Pediatr Radiol. 1998;28:272. Fitzgerald JJ, Jaspan T, Cartmill M. A benign pilomatrixoma mimicking a skull vault tumour in a 9 month old. Br J Neurosurg. 2003;17:469–470.